The Edwards B454-E is an independent double bass axial flow valve system. Valves are pitched in F and Gb (combined to produce D). The independent setup gives players additional positions with which to work. With the open wrap design, the B454-E has a very open feel. These valves are very dependable and maintain the same sound on F, Gb/D, and Bb sides. The B454-D-E is a dependent double bass axial flow valve system. The second valve (D) will only work when the thumb trigger (F) is depressed. 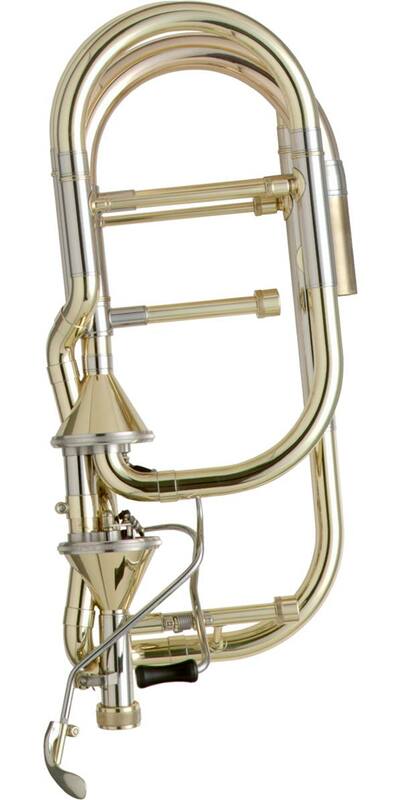 There is a more open feel with the dependent configuration as the second valve does not interrupt the airflow on the open side of the trombone. This combination results in the most free-blowing bass trombone made today. Your Edwards Axial Flow Valves will provide you with a lifetime of use if properly maintained. Valves are nickel plated and will not oxidize. Maintenance is also easily done. For best results, use only Edwards oils. For tools, lubricants, and any miscellaneous items, contact Edwards. Please visit our trombone maintenance page for more information and detailed instructions.